Attracting millennial clients is hard enough. But once advisors have won Gen Y business, many say they don’t know what continued services they need to offer to keep it. Experts say there are three keys to keeping millennial clients – modernizing practice technology, changing outreach methods and providing investment education. Effectively using technology is essential to retaining millennial clients, Will Goodson, a financial advisor at Financial Synergies, a firm with $700 million assets under management, says. Millennials want to check investment performance on their own time and having technology that provides on-demand access to portfolio information is of paramount importance, he says. Financial Synergies specifically uses financial planning software that gives millennial clients 24-hour remote access to portfolio information, he says. Making portfolio information accessible through technology is also important to provide millennials with the transparency they demand, Michael Tiedemann, CEO and CIO of Tiedemann Advisors (formerly Tiedemann Wealth Management), says. Having transparent investment monitoring systems that can be freely accessed lets millennials see their portfolio assets and weighting and keeps them from being left in the dark, he says. Millennials need transparency because they are more skeptical than older generations, says Louis Cannataro, wealth management advisor of Cannataro Park Avenue Financial, a firm with $800 million assets under management. Millennials are presented with different investment strategies every time they go online, making it hard for them to develop faith in one approach without supporting evidence, he says. Technology providing investment transparency can help millennial clients build faith in their FA's investment approach. Tom Johnson Investment Management, which has $1.2 billion assets under management, also finds it important to provide technology that makes data available on demand via web or cloud services, Cory Robinson, vice president and portfolio manager, says. While the firm currently relies on custodians to provide remote access functions, its advisors have talked about adding system functionality to match Gen Y investors’ changing demands, he says. Millennials “are used to getting all the information they need without talking to a live person,” and advisors must adapt to their needs. Tiedemann Wealth Management, which has $18 billion in assets under advisement, is furthering its financial technology by creating mobile functionality to cater to millennials, Tiedemann says. Smart phones are the default source of information now and a mobile platform will let Tiedemann Wealth match that trend, he says. Besides providing online portfolio monitoring, advisors must adjust to best practices for ongoing communication with millennial clients, Wesley Karger, co-founder and managing partner of TwinFocus Capital Partners, says. These younger clients are looking for different means of communication than their parents and at TwinFocus Capital, which has $4.6 billion under management, FAs contact millennial clients more socially through “text message and Facebook,” he says. Millennial clients sparingly check their emails a few times a week and instead are “always on their phones,” he says. When talking to younger clients Karger also emphasizes the “softer side of wealth management” – only presenting clients with information relevant to their interests and needs, he says. Millennials are focused on time efficiency more than previous generations and don’t read entire investment briefs, he says. FAs wishing to connect with millennials must tailor the investment information they present to them, rather than give broad overviews. Goodson says Financial Synergies also uses digital newsletters and blog posts as soft forms of communication with millennials, forgoing multiple investment calls because “millennials don’t want to be called every day” by their advisor. Using forms of soft communication helps Financial Synergies keep in touch with Gen Y clients without making communication overly formal. Karger agrees with Goodson and says millennials are “more hands-off” in the investment process than older generations. Instead of giving them scheduled reports, he provides them access to investment materials through online portals, including press he knows appeals to them. Learning millennials’ interests is complicated and involves understanding their positions in life – including student loan worries or potential career path switches, Goodson says. 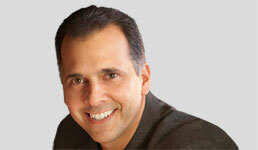 But he says it is a major part of building effective communication with Gen Y clients. 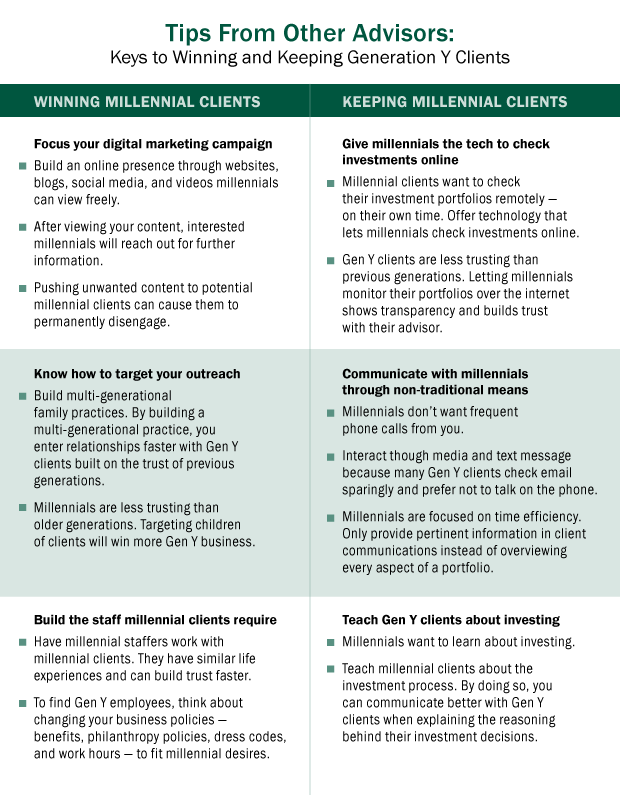 Communicating with Gen Y clients means building their investment knowledge, Goodson and Tiedemann say. Fortunately, learning about investing is something in which millennials are interested. Kevin Mulhern, cofounder and CEO of AdvisorStream, says millennials are the demographic most interested in learning about investing – and a Fidelity study reveals 44% of 21- to 30-year-olds are extremely interested in learning more about investing. By providing educational resources on investing, advisors can help millennials gain the knowledge they seek while fostering relationships with Gen Y clients, Mulhern says. At Financial Synergies advisors teach millennial clients about investing to help them understand the investment decisions their FA makes on their behalf. Goodson says it supports transparency and builds trust in FA decision-making if clients understand the process.